There’s a new trend in office design that has been steadily picking up its pace the past couple of years, and now it looks like it’s here to stay. As humans, we’ve become more aware of the importance of getting exposed to nature in our daily lives, which is why it has become more readily intertwined in our work environments. Between longer working hours and longer commute times, the outdoors is making its way indoors to make up for lost time. 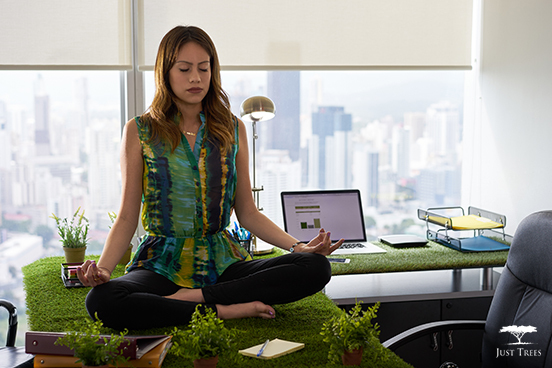 Through enhancing environments with a variety of biophilic features such as green walls, plants, natural woods or stone, and more that mimic the natural world, businesses can reduce these negative workplace associations. Biophilic design, at its core, uses nature as a framework to weave the patterns and forms of the natural environment into the built spaces through the use of textures, patterns, natural lighting, and live plants. As a way of promoting the eco-friendly philosophy of Biophilia, here are a few examples of biophilic designs in the office environment. For businesses with budget restrictions and minimal light exposure, for example, a lovely moss wall is a great versatile element to incorporate into a design. These are low-maintenance, aesthetically pleasing, cost effective and they don’t require too much sunlight. Companies often also opt for working a more natural aesthetic into their cultural identity in terms of branding. This is also a way of actualising their mission statements and sustainability goals. 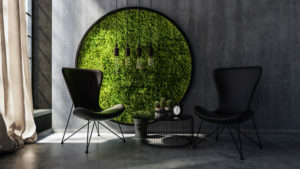 Moss walls could be used in this manner, but leafy plant backgrounds are a favoured alternative as seen in the image below. In general, living walls are an efficient use of space that allow for even more plants to fit into offices. However, an exterior green wall outside of the office is a big statement and it is ideal for both commercial and residential property. 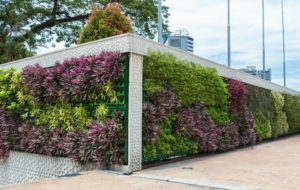 A living wall has the ability to enhance cityscape and add a stunning green impact to the community. 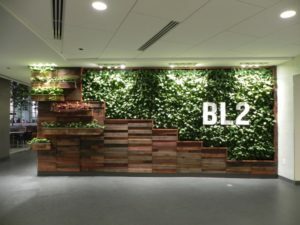 The image below is a great example of how the vertical garden can be used on the outside to represent the eco-friendly values of the company. It’s aesthetically pleasing and it brings more of the natural elements into the urban environment.